Reproducing metric simple rhythms was most accurate. For the reproduction task, participants heard each rhythm 3 times, then tapped back what they heard on a computer keyboard. 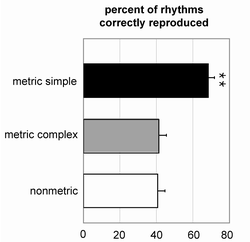 As you can see from the graph on the left, the metric simple rhythms are remembered correctly significantly more often than the other two types. This pattern has been replicated with rhythms made with brief percussion noises (rather than longer sine tones). For the fMRI study, participants performed a rhythm discrimination task. They listened to 3 presentations of a rhythm, and had to decide if the third presentation was the same as or different from the first 2 presentations of that rhythm. We measured brain activity when participants were hearing the first 2 presentations (we only measured activity related to listening and trying to remember rhythms, not activity related to discriminating the change, so the third presentation was ignored). This picture shows greater activity in the basal ganglia to metric simple rhythms compared to the other two types. This suggests the basal ganglia play a role in beat perception. This graph shows relative activity to the three rhythm types. Significantly greater activity is observed for the metric simple condition than the other two conditions in the basal ganglia, supplementary motor area, and superior temporal gyri (auditory cortex).